Punches, which one is the best? Well, in a nutshell all punches are good as they all serve a purpose. That purpose is determined by the situation, the circumstances, the targeting, the timing and the power applied. No one punch, in general, is the best or most powerful. It depends. Many will also find that the most powerful technique applied, in general, tends to be the open hand rather than the fist. Again, that also is determined in the moment as determined by the situation, the circumstances, the targeting, the timing and the power applied. In the system I practice, Isshinryu, it is often stated that the vertical fist is the stronger punch but as often that depends, i.e., it depends on the testing model and all the variables applied as well as the bias of the testing and the group performing the tests. 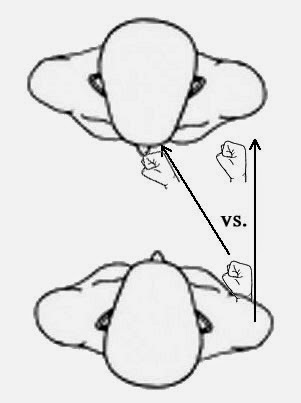 In very narrow parameters one punching technique and fist formation may well be superior to others but again - it depends. Isshinryu’s vertical fist techniques are superior in all ways, in Isshinryu as it is taught, trained, practiced and applied. All in very narrow parameters that are directed in support of and application within the “Isshinryu system.” It also depends on who is teaching the system and how they apply it also in narrow, restrictive to supplement and support that systems teachings, set of parameters, etc. In that narrow and special way, it is superior. In the end it is better to ignore such claims of superiority for the more inclusive coverage provided by the fundamental principles of martial disciplines/systems. In other words it is more about the proper application of principles that would provide for a particular applied techniques according to circumstances within a narrow moment in time to achieve power, speed and efficiency/proficiency to a target that comes from the application of proper “Targeting, Timing and Power Generation.” This is where principles rather than a specific technique shine bright shedding light on the subject regarding defense, combatives and fighting - civil and militarily. 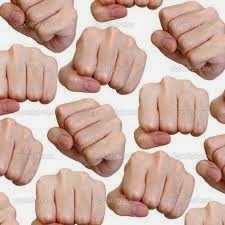 Why does the fist travel up the outside of the body? In Isshinryu, my system of practice as example, the vertical punch stays aligned with the outside of the body (see snapshot). When executed in the basics and the kata, most executions, the fist seems to move, rise up, toward the outside of the bodies of both the person executing it and the adversary as they stand facing, i.e. during two-person drills. Granted, this may not be the intended targeting yet when you watch video’s or actual demonstrations this is where you see punches go as to paths. Take a look at the top view I attempted to draw as to the pathway of a vertical rising punch seen in basics as kata. The question comes up rarely because when taught the practitioner, being a novice and even student, tends to blindly accept that this punch is done this way because …. In my view this is inadequate and missed a very important lesson taught through both basics and drills. Much of bunkai is molded to fit certain applications rather than reality. Yes, the rising punch when applied in appropriate situations for appropriate actions is a good thing. It is not the end all thing as often assumed in training and practice. It is about how to use a basic, fundamental concept, to achieve a better, reality based, application once you pass the basic/novice teaching and learning levels. The rising punch as depicted in the snapshot of Tatsuo-san, although not a basic or kata based other than in this pose for sanchin [couldn’t find or create an adequate and accurate rendition], simply demonstrates the proper, fundamental, way to perform the punch with not further explanation as to how that punch is actually applied. This is due to the educational modifications of kata, etc. for the educational systems implemented early 1900’s and not reverted for more progressive practice and training. In reality, the pathway of the punch, if done with proper kamae, results in the person applying the punch moving off-center of the adversary so that the punch is actually applied to the centerline of the adversary. This is the simplest bunkai for this post. See second snapshot below. One of the major bunkai that is not readily present or observable for both basics and kata are the shifts necessary to move off center of an adversary while maintaining our centerline to achieve an application of a technique like this one, i.e. to achieve maximum efficiency and application while providing a type of Loop (OODA) reset to the adversary, etc. 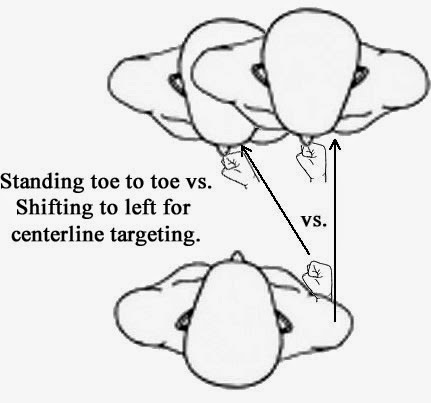 To apply this technique and follow the principles the practitioner must move off the adversary’s centerline and often at about a twenty degree offset to the right and forward (not depicted in snapshot) as the rising punch is redirected toward the adversary’s centerline, i.e. the solar plexus, while the shift and turn of the body keeps the practitioner’s centerline toward the adversary’s centerline while taking the adversary’s centerline off causing a reset of the, observe and orient, loop thus providing time for the practitioner, etc. If you view the makiwara basics below you will notice that when punching the makiwara the practitioner has their body shifted to one side and the other for proper punch application in relation to the practitioners body as the makiwara represents the centerline of an adversary and so on. This is to depict the positioning of the vertical rising punch as executed in basics and kata drills, etc. When normally practiced, the fist path is directly forward as if the punch is going to hit a target of the adversary's shoulder/arm vs. the centerline solar plexus. In this version, the practitioner shifts to the left so that the punch will strike the adversary's centerline/solar plexus, as only one possible target, taking their centerline away from the adversary while maintaing the integrity of the punch, body, alignment, etc., to achieve greater power to the target, etc. Keeping to the fundamental principles and exploiting the adversary's OODA, i.e. reset the loop to OO levels to gain and maintain the advantage and so on …. Remember, all bottles are good, they all serve a purpose. Caveat: This is my post and my views and my perceptions, not Clarke Sensei’s. The quote above as a question on his site under a photo inspired my post today, nothing more and nothing less. Don’t read into this post as anything Clarke Sensei says or writes or does not say or doesn’t not write or believes or does not believe - it is my perspective and perception and any inferences are mine and mind alone. First, as a sign of progress is more or less dependent on the individual, the dojo, the Sensei, the Senpai and so on for those unique individuals. It is a personal matter that often gets projected to larger groups with differing perceptions and perspectives and there lies the rub and the fuel that ignites flame wars. Granted the second statement requires clarification because when a novice is learning they are still ignorant to the system and its ways until they reach a certain level of academia and physiokinetic proficiency, understanding and knowledge. It is only when they begin to deviate from the path they follow according to the teachings of the dojo and its sensei that they begin to realize and recognize their self-discovery, self-realization and self-analysis that allows them to determine the accuracy of the level or grade as appropriate to the progress they are achieving. This is the tricky part simply because external influences in the dojo and in the martial communities will influence their thought processes on this especially as it pertains to the human instinctual need of a group dynamic as discussed in human survival instinctual teachings that are group and societal dynamics. Third, the practitioner must then have achieved a level of maturity that will allow them to join others outside their dojo while allowing for a return to the bottom to gain acceptance in dojo and communities or groups or tribes that have “different” needs, beliefs and requirements due to different perspectives and perceptions. It is important that the practitioner have as their understanding and belief that such differences and changes have nothing to do with their progress to date along with the level they personally feel and achieve in relation to the new dojo, tribe of social group. When you try to create a grading system to recognize and symbolize progression in a martial system you open that system to the incongruities of human nature and differences. It then pits one person against another as well as one group against another creating a divide between like-minded folks in an overall community under the heading of martial arts, martial systems, or martial styles. One persons treasure may be another persons junk and that goes for gradings and levels as that disparity under differeing community dynamics tends to create. This is why any attempt to achieve a larger governing community or association tends to fail or at least fall way short of this most personal aspect to the martial arts. The uniqueness of human qualities, perceptions and beliefs leads us to recognize this and yet humans still try to assign “things” that will allow them to be managed or governed or controlled where control, government or management is not appropriate. This is why I personally believe that ranking, grading or levels of progress must be a dojo and only a dojo thing. That is why I believe, even at the dojo level, that requirements that are both … and … are best served if derived from the principles that underly all martial systems rather than the specifics created by each individual system or style. The only reason there are systems and styles is the human need to gather into groups or tribes for a perceived survival need but principles transcend all this human intervention through ego and pride based requirements. What is it and how does that definition apply to the martial arts (emphasis on Okinawan karate, my system of practice)? In the past I have attempted to answer this question with some success but in reality the questions answers have changed drastically. In MA/SD the emphasis is most often on the technique, i.e. here is an attack and you need to learn this to counter it, etc. This is no where near true self-defense, as I understand it. Note: remember, all this is my perspective, my perceptions as to experience, training and practice all subject to validation through reality/real life experience as such. So, lets answer the topic title question first, “What is Self-defense?” In order to fully understand what SD is you have to gain knowledge of all the area’s that involve and affect conflict and violence as it applies to SD - and that is also a narrow view port to the entire spectrum of SD, Conflict and Violence (just take a look at the terse, incomplete/not comprehensive, list in the below bibliography for more). Responses are my personal opinions on the quotes and do not reflect the teachings of Rory Miller or his books. 1. Donning a black belt, stepping in front of a class to teach, you are seen as an expert on violence. Response: The simple truth is that many of these experts have no experience with violence. 2. Fair, does not happen in real life, not if the bad guys have anything to say about it and not if the professional good guys do, either. Response: Almost everything within the teachings of “MOST MA” are based on mutual agreement, safety, and a sense of fair play. Fair play does not exist in real life. 3. If there has been little conflict in your life, your character, your identity, is mostly fictional. Response: As Mr. Miller will say later in his book, most of what we know about this subject comes by “Word-of-Mouth” and often that comes from what we are exposed to as to media, etc. i.e., television, news as to TV and Internet, movies and other entertainment stuff. 4. Survival is very much a matter of guts and feelings and smells and sounds and very, very little a subject of words. Response: This kind of describes those reality based things that are not taught in SD. SD tends to be mostly about words as to conveying the teachings along with what one feels are correct responses to conflict and violence - most often techniques against specified and specific techniques - and feelings that are not validated by first hand experience applying SD in real life, etc. 5. Take the information in this book (referencing his book meditation on violence) and treat it skeptically as hell. Response: Take that to mean all his books, all his works, all his teachings and all his experiences simply because they are “HIS and NOT YOURS.” What works for me may or may not work for you and that goes the same even from an expert and professional such as Mr. Miller and so on. This includes other media outlets such as video’s, seminars, classes, the Internet postings, and so on to INCLUDE any and all the stuff I put out from my end - especially my stuff cause I ain’t no professional and ain’t no expert. 6. Physical Response to Violence - not about effective technique but about what makes a technique effective. Response: Don’t take any direct and seperated quote as gospel but rather as a small part of a whole because this quote by itself means a good deal but know that avoidance, etc., are far more important - in my mind - than learning ROTE techniques against ROTE attacks, etc. 7. Martial arts and artists, and even people who fight for real on a regular basis have also only seen a very small part of this big thing. Often, the best know one aspect very well, but that is only one aspect. Response: To my mind this statement simply emphasizes that SD, Conflict and Violence is HUGE and COMPLEX and NO ONE can teach you everything and every method to defend against it. Even the professional who provides us this window toward a complex and difficult subject will readily admit that what they experienced was only a narrow view of the entire picture. One reason I have several of these guys works in my library and under my studies, they all have benefits according to their personal experiences and beliefs, etc. 8. Violence is complicated as HELL (my emphasis all caps). Just “ONE PIECE (my emphasis again)” - Interpersonal violence - you would need to understand physics, anatomy and physiology, athletics, criminal law, group dynamics, criminal dynamics, evolutionary psychology, biology and evolutionary biology, endocrinology, strategy, and even moral philosophy. Response: Wow! See what I mean. It is a wonder that more folks are not hurt or killed by conflict and violence than what occurs today. I cannot think of one person I have met over the last thirty-eight years or so that can meet those credentials and teaches self-defense or martial arts, not one. I can’t claim them for sure although I am working on understanding them a bit, a small bit. I suspect that Rory Miller may have actually truncated the list for brevity and to get the point across that it is really, really COMPLICATED. Just read his books then read Marc MacYoung’s book INoSD and then realize they are just touching the surface of this subject. Note: Although my efforts so far was to answer the original question the following actually does that for me as a quote from the book used to create this post. 9. Self-Defense is recovery from stupidity or bad luck, from finding yourself in a position you would have given almost anything to prevent. It is difficult to train for because of the surprise element and because you may be injured before you are aware of the conflict. The critical element is “To overcome the shock and surprise” so that you “Can act,” to “Beat the freeze.” Self-defense is about recovery. The ideal is to prevent the situation. The optimal mindset is often a conditioned response that requires no thought (for the first half-second of the attack) or a focused rage. Response: I can say that little to none of my martial arts training was geared toward any of the above in regard to self-defense or even fighting other than maybe the school yard scuffles, social stuff, we all experienced in our youth. This may not be a complete and comprehensive explanation to what is self-defense but it does provide a good picture to compare to what we are all taught as self-defense. Response: If we are truly going to study a martial art toward self-defense then we have to take into consideration all that these professionals provide as to the world of conflict and violence. It is NOT what we think it is and it is NOT what we perceive as to our narrow exposure to experiences we may have encountered in life. Very few are exposed to long-term conflict and violence. Even the professionals who are required to step into harms way experience a very narrow view of conflict and violence as dictated by the professional description of their jobs be it military vs. police vs. corrections vs. professional protection vs. bouncers and so on. Every time I study the subject and re-study previous studies I find new and different views and teachings and that has not gone into the actual reality based training and practices they recommend if one is serious toward self-defense, etc. Yet, our society is flooded with folks who are “Experts” in the field of teaching MA/SD.